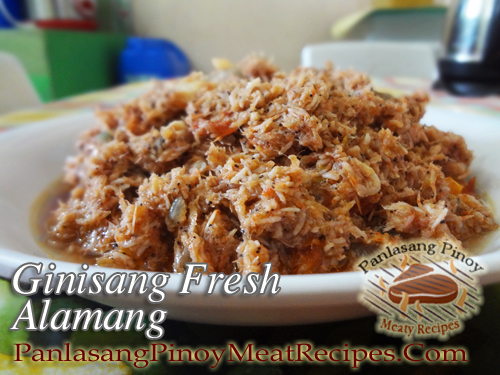 Guisadong alamang is a very simple stir fried fresh krill dish that you will surely like. Just for the info, fresh alamang is not to be mistaken as bagoong alamang which is already salted and fermented. Fresh alamang can be bought in the local wet market but sometimes it can be seasonal. By the way, just to mention some info about the alamang, I thought those were baby shrimps that are catched by fishermen using a fine net. But actually those are small species of shrimps called “krill”. They are also a good source of omega 3 oil. Wash the krill or alamang in running water using a sieve. Drain. Heat oil and saute garlic and onion until the onions are wilted. Add tomatoes and saute until it becomes tender. Add the fresh alamang and saute until half cooked. Add a pinch of salt and pepper. Continue to saute until done. Serve hot. Mix the calamansi juice and patis to make a dipping sauce. Thanks for this alamang recipe and your little info about the krill. Glad you like the recipe Willy. Hi Aileen, I think you can make an omelet for the ginisang alamang leftover. how much dose it cost to make this meal.